So, I've been nesting ALL SUMMER...cleaned the basement, purged toys, back-to-school shopped (I've even Christmas-shopped!! ), painted rooms, organized kitchen cabinets...and still my house is somewhat of a mess...go figure! However, I have managed to institute schedules and organizational solutions to some of the "bottleneck" times of our day. Two of those times are bedtime and morning. I realized that bedtime had become too routinely a time of a lot of frustration and raised voices and craziness and last-minute requests. And a lot of Mom and Dad reminding everyone verbally what is to be done next. In her book, Walking Into a Hug, Janene Ustach mentions that bedtime should be a "blessed time." 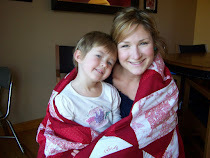 And I wanted our bedtimes to become more of a peaceful, happy time...a time to connect with my kids and to reassure them, not just a time to rush and hush! Same deal in the morning...I wanted to send them off to school with love and hugs, not reprimands! Since I was already making a simple after school chore chart for the kids, I also made a bedtime/wake-up time "road map" to help our little ones VISUALIZE what bedtime should look like in our house. Since I've got mostly pre-readers, I just used images off of a Google image search...I tried to find the happiest looking images so that my kids could start to internalize that this was not just a "to do list", but a time to wind down and to embrace. I want them to understand that when we all do the little things we are responsible for, it leaves us time for extra "fun with Mom" before school and "hugs with Dad" before bed, etc. This is our after school chore rotation. One night before bed, I saw Autumn, my three-year-old, carefully studying the "bedtime" map. She never forgets to carry her basket upstairs, which is number one on the list. That was another thing I instituted. I was getting tired of personal items piling up on the landing of the steps. It's a hazard, and I am just no longer able to get it all upstairs every night! So, I bought the kids these baskets with handles at Walmart. Throughout the day as we tidy up, I put their items in their respective baskets, or they do. Every night, they carry their own baskets upstairs and put their stuff away. No more overwhelming piles of who-knows-what on the steps for mommy to deal with! Yay! Then I was reminded of CaMarie Hoffman's post from last year's Family Proclamation Celebration about Reaching Your Family's Potential. She talked about how they create posters of their family goals using pictures they cut out of magazines, and they post it where they can look at it often. It helps them to visualize what they want their lives to look like...and achieve it! So what do you do as part of your daily routine to make things more lovely when they can easily get hectic? Do tell! PS - You can still enter this week's giveaway...just go to this post and give me your name suggestions! I will announce the winner of the Gospel Chicks prints tomorrow! This is a great idea! (again) Now would be a good time to start routines since school is starting. We have been doing scriptures at night but I want to try morning and see how it helps our family. We also have our kids do chores every day (take care of chickens and do dishes) and then clean bathrooms/ vacuum on Sat. morning. Thanks for your inspiration Jocelyn! so glad you got rid of diveris or whatever it was called. Great ideas even for retired mothers...lol! I had to chuckle at your explanation of all your work and that your house is still a mess. Darlin' it always will be 'cause people live there! When our children were little I'd visit teach older ladies in their beautiful orderly homes and say "When I grow up I want to have a house like this." They'd just laugh and remind me that while their children were growing up their homes looked just like mine. Anyway, we used picture charts too to remind the children of their morning work and their night work. It really does eventually become ingrained as habits, though it doesn't always show until they move away from home. I have always said to the children, when you move away from home you can live anyway you want to, but while you live in my home you will live the way I teach you, and then when you move out you can never say "my mom never taught me" because I am, I have and I will continue to as long as you live here. Keep up the good work, your children are going to turn out great. What a great chart, I've tried individual ones before but I think a family one is such a good idea. Looks like the comments are working. I love your idea and will have to put that on the back burner for when my kids get older. Though my husband and I might need the baskets now.